On one Eden Prairie Area Chapter of Let’s Go Fishing excursions last summer, fisher people caught, and released, an estimated 150 panfish. Needless to say, the fishing/catching was easy. The Eden Prairie Area Chapter of Let’s Go Fishing, one of 20 such chapters in Minnesota and Wisconsin, got its start at the end of the 2012 season. Its vision is based on the notion that lives can be changed by experiencing the joy and freedom of being out on the water to fish or just enjoy the beauty of a Minnesota lake. Last year alone, the Eden Prairie chapter guided a record 325 fishing excursions on Riley Lake. In August, it facilitated 450 pontoon rides as part of the city of Eden Prairie’s Riley Lake Park Grand Reopening. Thirty-one months after his last snap for the Vikings and about nine months after brain surgery, Mike Harris is living a full life. After spending four NFL seasons throwing behemoths to the ground, the 29-year-old former offensive lineman is now focused on picking up people. Harris stays busy volunteering at Let’s Go Fishing in Eden Prairie, dabbling in jiujitsu and, as of this summer, coaching offensive linemen at Hopkins High School. Let’s Go Fishing- Itasca was formed in the fall of 2007. Thanks to donations and grants, the organization we were able to raise monies to purchase the first pontoon in the spring of 2008 and began to offer this program to our seniors, handicapped, veterans and youth at no charge. They schedule fishing trips and cruises 5-6 days per week in the morning, afternoon and evenings providing all equipment needed June through September on our handicapped accessible 25-foot pontoon. The month of May schedules are reserved for youth groups. All this at no charge to the participant. The mission of Let’s Go Fishing Itasca is to continue to serve older adults, youth, veterans and disabled throughout Itasca County. Let’s Go Fishing has always had its core the desire to serve older adults in our community. 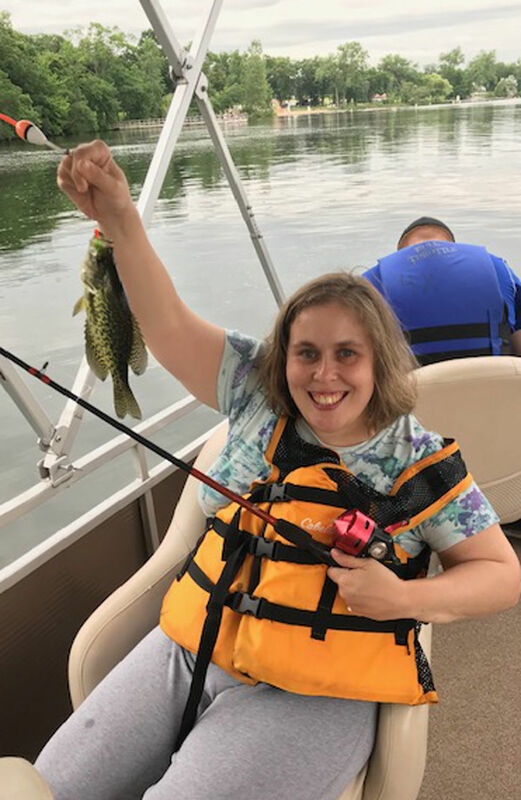 Whether they are part of a housing community or individuals still living in their residences, older adults benefit greatly from joining with others and taking a morning or afternoon trip on the Let’s Go Fishing pontoon. We have had families taking out senior family members. A granddaughter who wanted to take grandpa fishing. Seniors doing what they remember doing and thought they would never be able to do it again. Read more at Herald Review…. Eden Prairie is home to many great civic organizations where residents come together as individuals and as groups to improve the wonderful experience of living here. Certainly, this collective experience of “giving back” contributes to the high quality of life ranking that Eden Prairie regularly enjoys in the national press. This is the story of one such organization that is a shining signature of who we are as residents of Eden Prairie and as Minnesotans. The Let’s Go Fishing Eden Prairie Chapter touches many lives each summer with a Minnesota tradition, Fishing! As Minnesotans, we celebrate the sport of fishing as a way of life – and as a symbol of who we are. Fishing is a sport – a pastime that embodies our culture, connects us to family and friends, and provides us long lasting memories from early childhood to our senior years. Memories of fishing are personal to each of us bringing back weekends at the cabin, that special time with our grandparent, and for me, the fun experience with my favorite uncle. These are moments and memories never to be forgotten. The Let’s Go Fishing Eden Prairie Chapter was formed by its Founder, Joe Holm, and his wife Carolyn of Willmar, MN, who presented their organization, its purpose, and potentials to the local Lions Club. Post presentation the Lions were hooked! A Lions board was formed that included Mike Smith, Terry Eggan, Mike Gruidl, Steve Olson, Richard Smith along with Lioness Peggy Muller and Gwen Wildermuth. The plan was devised along with an initial $15,000 donation to get the ball rolling. By Vicki Gerdes on May 18, 2017 –DL Online –Fishing and boating means so much to thousands of people in the Detroit Lakes area every year. But what about those who do not have ready access to the water, either due to decreased mobility, or a lack of someone to take them there? Since 2008, the Detroit Lakes Area Chapter of Let’s Go Fishing has been filling that gap, serving over 6,874 seniors, veterans, youth and physically challenged people of all ages. Normally they might not have scheduled a trip quite so early, Hochhalter noted, but the May 5 Hospice of the Red River Valley excursion was a last-minute addition to the schedule, to honor two of their longtime volunteers — one of whom is currently a Hospice patient. https://lgfws.com/wp-content/uploads/2017/05/DetroitLakespaper.jpg 484 860 dmohr https://lgfws.com/wp-content/uploads/2015/03/LGF_LOGO_Horizontal-300x193.png dmohr2017-05-22 15:49:222017-05-22 15:53:43Want to spend some time on the water this summer? SPICER — Let’s Go Fishing launched its 15th season in a big way this week, and appropriately so. The Willmar chapter has already seen a 41 percent bump in registrations from last year, and it is usually in the next couple of weeks when most of the registration calls will come in, according to Jim Gauss, president of the Willmar chapter. “We’re getting calls from all over the place,” he said. The calls are welcome, as the chapter is ready for a big year. It has a good group of both new and returning volunteers on deck for the season, although new help is always welcome, he said. The volunteers launched the season Monday and Tuesday by hosting approximately 300 elementary students from the Willmar Public Schools on Green Lake. Three pontoons made a total of 18 trips to give the young students from Kennedy Elementary an opportunity to enjoy time on the water. Studies have shown that nature has beneficial effects on mental and physical health. Let’s Go Fishing is a nonprofit 501(c)(3) organization that was established by Executive Director Joe Holm and his wife Carolyn, of Willmar, in 2002.